0/3: When I bought a box of Diesel Wicked some time ago I was not expecting to find an extra cigar in it, especially one in a coffin (a coffin with holes in it summoning images of some feral beast being locked in its cage to protect the town folk from its murderous intent). So that was pretty cool. Also, I don’t really know much about this cigar other than it is 6″ long, has a pig tail and I’d say the ring gauge is around 52 or 54. There are a good number of veins all over the wrapper but, for the most part, they’re fairly superficial. 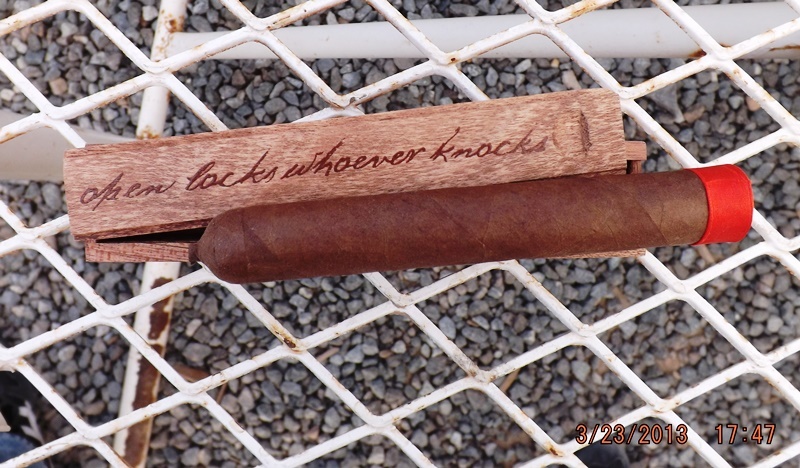 It feels like it is uniformly packed and there’s a little give to the cigar as well. I’m excited to smoke this cigar as it’s kind of a blind tasting (although, I’m relatively certain there will be a good helping of Nicaraguan tobacco in this cigar since it is an A.J. Fernandez blend). 1/3: It starts out nicely with earth, cocoa and some rich grape flavors. Actually, I think “rich” is the right way to describe this cigar thus far. 2/3: The second third continues on where the first third left off until some spice and wheat notes start taking over shortly after the halfway point. I did like that first grouping of flavors – dark flavors with some depth – but these flavors that are coming on are nice in a slightly different way – a little more excitement and a bump in the intensity (not the strength as in full bodied or medium bodied, per se) of the flavors. 3/3: During the final third dark wood gets added to the picture along with a shift in the spice more towards sweet spice. 4/3: Medium-full bodied with a good draw and burn; this unnamed cigar definitely has it going when it comes to the richness of its flavors but does it work on other levels? The flavors themselves are pretty good and they work well together but they lack a certain amount of vibrancy and clarity to be a truly great cigar. So it works on a couple of levels at least. What it all boils down to is one simple question: Would I want to smoke another one of these cigars? Yes, I think I would. Now I just need to find out what the name of this cigar is.